Signed into law by President Andrew Jackson on May 28, 1830, this act authorized the president to grant unsettled lands west of the Mississippi River in exchange for Indian lands within existing state borders. 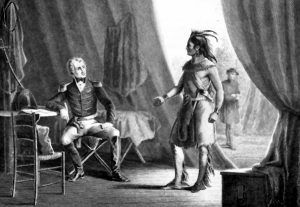 Before becoming president, Jackson had been a long time proponent of Indian removal. In 1814, he commanded the U.S. military forces that defeated a faction of the Creek during the Creek War of 1813-1814. After their defeat, the Creek Nation lost 22 million acres of land in southern Georgia and central Alabama. The next year, in 1815, and again in 1818, Jackson marched against the Seminole Indians in Spanish held Florida, in part to punish them for their practice of harboring fugitive slaves. As a result of the attack in 1818, the Spanish government realized that it could not defend Florida against the United States. The next year, Spain sold Florida to the United States. In addition to leading the charge against some tribes, Jackson was also instrumental in negotiating nine out of eleven treaties between the years of 1814 and 1824, in which they divested their eastern lands in exchange for lands in the west. Of those tribes who signed treaties during this time, they did so for strategic reasons – hoping to retain control over part of their territory, by ceding some portions; and to protect themselves from harassment by white settlers. As a result of these treaties, the Federal Government gained control over three-quarters of Alabama and Florida, as well as parts of Georgia, Tennessee, Mississippi, Kentucky and North Carolina. This “voluntary” Indian migration; however resulted in only a small number of Creek,Cherokee and Choctaw Indians actually moving westward. Many others resisted the relocation policy and the Creek and Seminole waged war to protect their territory. But, as more and more white settlers made their way to the South, their protests became louder and began to pressure the Federal Government to acquire more Indian lands, so they could expand their farms to raise cotton and to remove the Indians who they felt were obstructing progress. The tribes became even more of an “obstacle” after gold was discovered in Georgia and the pressure on the government increased. In the meantime, several tribes began to adopt white practices, such as farming, education, and holding slaves, in an attempt to ward off hostility and to co-exist with the new settlers. In the end; however, their efforts would be for naught. 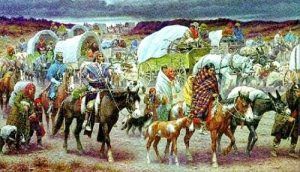 When Andrew Jackson was elected president in 1828, the policy of Indian Removal would become even more prevalent. In his first year in office, early in 1829, he called for an Indian Removal Act and worked quickly towards that goal. Even though there was significant opposition by many Christian missionaries, and others including future president Abraham Lincoln, and Tennessee Congressman Davy Crockett, most European Americans favored the passage of the Indian Removal Act. In the south, the settlers were particularly eager to rid themselves of the “Five Civilized Tribes,” especially the state of Georgia, which was involved in a contentious jurisdictional dispute with the Cherokee nation. While Native American removal was supposed to be voluntary, in practice, great pressure was put on Native American leaders to sign removal treaties. Some Native American leaders who had previously resisted removal soon began to reconsider their positions, especially after Jackson’s landslide re-election in 1832. Affected tribes included the Cherokee, Chickasaw, Choctaw, Creek, and the Seminole. The Removal Act paved the way for the reluctant, and often forcible, emigration of tens of thousands of American Indians to the West. The first removal treaty signed after the Removal Act was the Treaty of Dancing Rabbit Creek on September 27, 1830, in which Choctaw in Mississippi ceded their land east of the the Mississippi River. The Treaty of New Echota was signed in 1835, which resulted in the removal of the Cherokee in the fall and winter of 1838 and 1839. During the removal, approximately 4,000 Cherokee died on this forced march, which became known as the “Trail of Tears.” The Seminole; however, did not leave peacefully and resisted removal, resulting in the Second Seminole War, which lasted from 1835 to 1842. Eventually, they were forced to move, with the exception of just a few who escaped. By 1837, the Jackson administration had removed 46,000 Native American people from their land east of the Mississippi River, and had secured treaties which led to the removal of a slightly larger number.